Heavy-duty metal pegboards are stronger than hardboard or plastic pegboards and will never rust, rot or corrode. Peg hook holes won't degrade over time like traditional pegboards. Great for storage, organization and display. If I paint over your colored steel magnetic panel, would it lose it's magnetic properties? Is the stainless or galvanized more magnetized than the colored steel? Thanks. 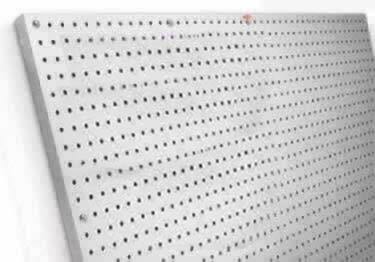 Heavy-duty metal pegboards are stronger than hardboard or plastic pegboards and will never rust, rot or corrode. Peg hook holes wonÃ¢â‚¬â„¢t degrade over time like traditional pegboards. Great for storage, organization and display. Trying to place spacers behind pegboard is a frustrating experience. These self stick spacers solve the problem. The description does not say you get glue dots and spacers but that is what they send you. Thank you for your review. Yes, something as simple as self-stick spacers can make a big difference in the mounting and use of our pegboards. We're happy you liked them. Great product, took forever to receive it. The shipping time took forever, I originally thought the product had been lost in shipment and was about ready to file a claim when it finally arrived. In the day of overnight shipping 2-3 weeks is unacceptable. When I did finally receive the Stainless pegboard both ends were dented in. A spot about 2 inches long and about 3/8 inch deep. Same on both ends, I was able to straighten both to the point that it is barely visible. This is my second stainless pegboard, both look great hanging and really work well.